Hopefully you already noticed that we decided to again participate in the Batavierenrace this year! The Batavierenrace will take place from Friday the 10th until Sunday the 12th of May. On Thursday the 15th of November UCGO will give an information meeting, where we will explain all the details of the Batavierenrace and where you can ask all the questions. It starts at 13:15 at UCG, the classroom will be announced. 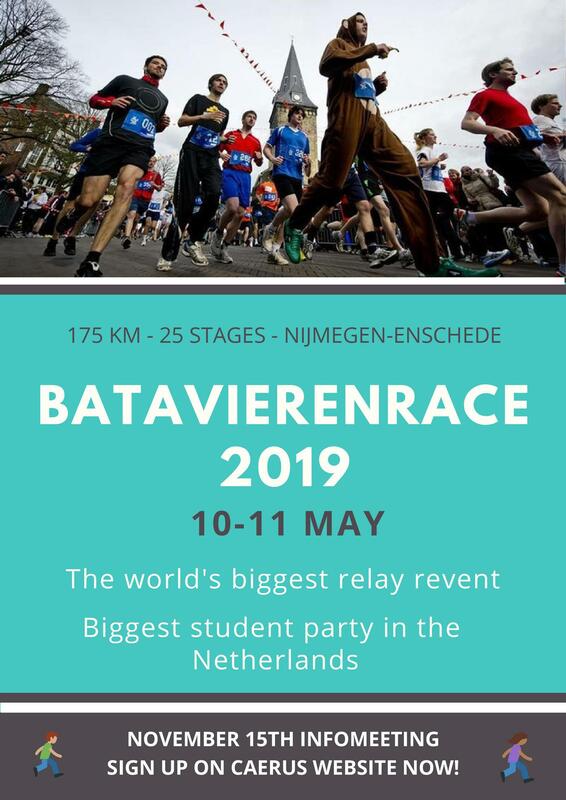 The Batavierenrace is a relay race over 175 km from Nijmegen to Enschede, divided into 25 stages varying from 3.6 - 10.7 km. Over 350 teams participate which means that in total more than 8,500 students from all over the Netherlands participate. The race ends with the biggest student party of the Netherlands! So don’t miss out! The sign-ups are now open! You can sign-up on the event “Batavierenrace 2019”. Watch the following videos to get a good impression of the weekend! If you have any questions; don’t hesitate to contact Irene, Eva or Sara from UCGO!